When we opened our doors in 1980, we had one definite goal in mind, to provide South Orange County’s Audi, BMW, Mini and Mercedes car owners with a high degree of workmanship and an excellent level of personalized service. Now, 30 years later, our goal has been proven by the many of our first time customers that still come to us and recommend us to their family and friends. In today’s times when the term “Personalized Service” has pretty much lost its meaning, we strive to keep its meaning alive. From the owner to the service advisors, to the excellent team of Professional Audi – BMW – Mini – Mercedes Technicians, you will always find “Service with a Smile”. This is one auto repair shop where you will find people that have EMPATHY for all your car problems or needs. 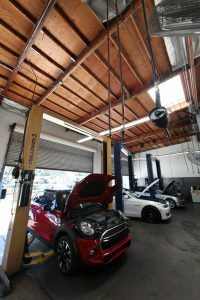 We utilize the latest diagnostic and repair equipment and install Genuine BMW – Mini – Mercedes Benz replacement parts. All services and repairs performed by Quality Motors will maintain your cars factory and extended warranties. Bringing your car to Quality Motors will save you time and money, 1000’s of our customers have made the switch since 1980! All our work is guaranteed for 24 months or 24,000 miles and we stand behind our warranty. We honor most extended service warranties and bill the warranty companies directly.